Creativity is the most sought-after skill among employers today. And the next time you get the urge to pull out a coloring book, remember that you can be more creative with an eight-pack of crayons than a 264-pack. Why? Because the brain works harder if it has fewer choices to make, according to Page Moreau, an innovative UW researcher who studies consumerism, problem-solving, and creativity. This is the kind of engaging research that alumni learned about at gatherings across the country this past winter and spring. The UW Now: Ideas That Are Changing Our World events were held in Phoenix; Coachella Valley, California; Atlanta; Washington, DC; San Francisco; Chicago; Milwaukee; and Denver. At the Atlanta History Center event in March, guests listened to remarks by Chancellor Rebecca Blank and then enjoyed five- minute “lightning talks” by three UW professors. They included Moreau; Faisal Abdu’Allah, a professor of printmaking whose groundbreaking work tackles racial politics and other controversial topics; and Jeanette Roberts, a campus leader who is working to bring a more coordinated approach to health-care programs to provide better care to patients. 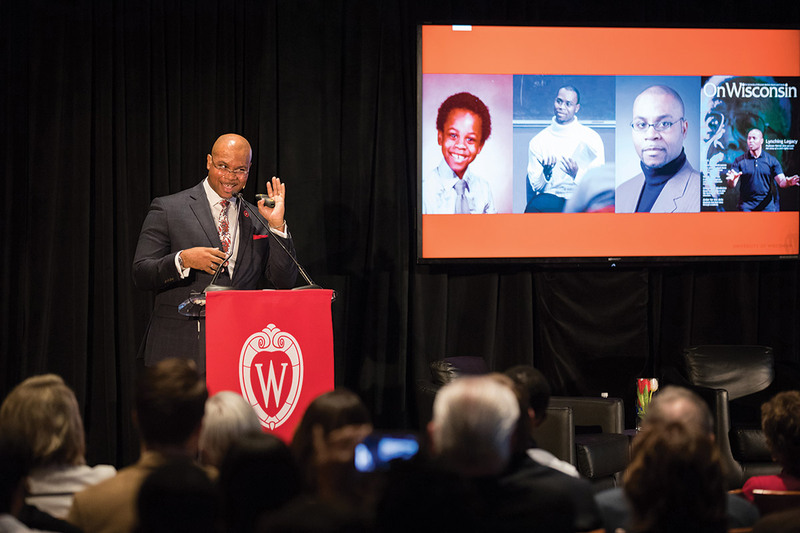 Vice provost Patrick Sims led a Q&A with the speakers, and Scott Jenkins ’86 accepted the Badger of the Year Award, which recognizes alumni for doing great work in their communities. Guests then joined Blank and other UW and alumni-chapter leaders for a lively strolling supper and a chance to network. 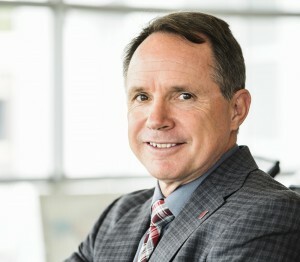 Michael Knetter left his position as dean of the Wisconsin School of Business in 2010 to become president and CEO of the UW Foundation, the official gift-receiving organization for UW–Madison. In 2013, the foundation helped the university launch All Ways Forward, a comprehensive campaign aimed at raising $3.2 billion by 2020. Where do things stand with the campaign? By midyear this year, nine months after the campaign was publicly launched — but three years after we had started the quiet phase of counting gifts — we are over halfway to our $3.2 billion goal. But while we’re thrilled to be over halfway there, we can’t take for granted that we will repeat the success of the transformational gifts by the Morgridges and Nicholases, or that the economy will remain robust throughout the remainder of the campaign. Alumni have a lot of concern over the UW’s relationship with the legislature. How do you see this evolving? It’s been a really extraordinary period for the University of Wisconsin in terms of the degree of tension that exists right now between our elected officials and the university over both resources and regulations, and even the very essence of our being, the definition of the Wisconsin Idea. Many public universities are facing the same tension, particularly in regions that aren’t growing a lot. And [Wisconsin is] not. That’s put a lot of pressure on the state’s finances and made it more difficult for the state to grow its contribution toward higher education at the same rate as private universities’ revenue streams have been able to grow. How are private institutions different from UW–Madison? Private universities rely on high tuition and philanthropy. It’s been a good period for increasing tuition, because the value of university degrees has gone up a lot. So if you don’t need to be burdened by concerns about affordability, that’s a great revenue opportunity. And it’s been a great period for philanthropy because, ironically, of the increasing concentration of wealth. We are fortunate that Wisconsin alumni who have attained great financial success have been very generous to UW–Madison. 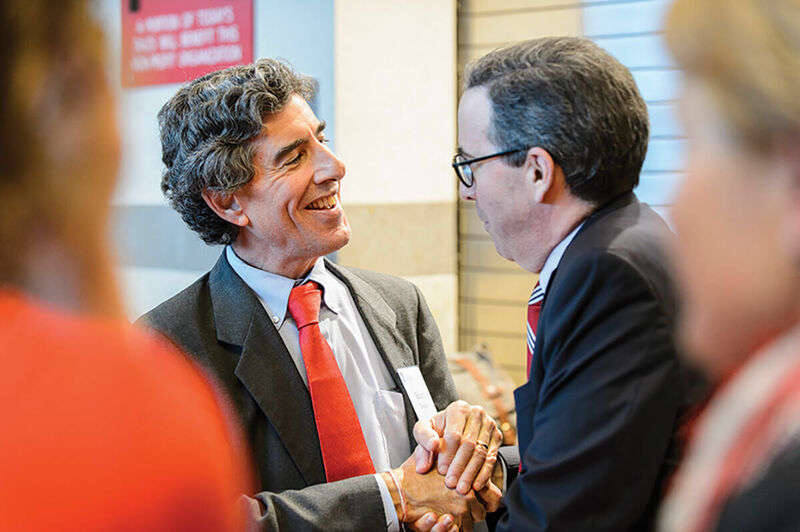 Alumni such as the Morgridges and Nicholases, who built successful businesses, are now transforming the educational experience for the benefit of future generations. Not everyone can give a major gift. What would you tell those who ask what difference their $50 or $100 makes? When you go to Camp Randall, there are always some people who start the Wave, but it only works if everybody participates. 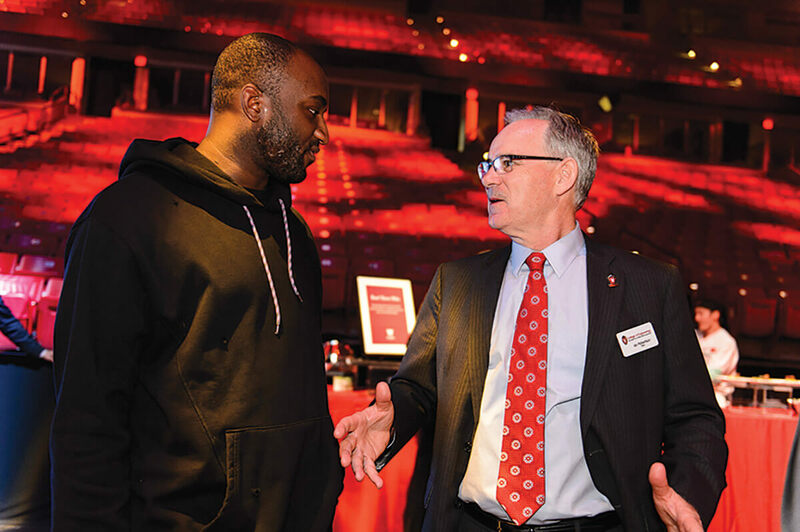 The Wisconsin way to appreciate the gifts others have made is to say, “Now I’m going to do my part, too.” All great universities have some big donors. But our strength isn’t in having a high proportion of wealthy alumni. We don’t. Not higher than Harvard, Stanford, Dartmouth, Princeton. But we have a lot more alumni than they have. Our strength is in our numbers. Albert “Ab” Nicholas ’52, MBA’55, a former UW System Board of Regents member and one of the university’s most dedicated supporters, passed away in August, but he left his fingerprints on the University of Wisconsin–Madison in myriad ways. Together with his wife, Nancy Johnson Nicholas ’55, he worked to open the UW’s doors to generations of new students, and they gave one of the largest gifts in the university’s history to support scholarships and fellowships. A standout guard on the Badger basketball team, Nicholas decided to forgo a career in the NBA and instead served in the army and then launched the Nicholas Company, a high-performing investment fund. He gave large sums to charity, particularly to UW–Madison, supporting the schools and colleges that taught him, Nancy, and many members of their family. That connection helped to inspire a lifetime of giving back to the university. Between 1982 and 2014, the Nicholases donated nearly $50 million to student services, the Department of Athletics, the Wisconsin School of Business, and the School of Human Ecology, establishing Nancy Nicholas Hall as the home of human-ecology studies on campus. 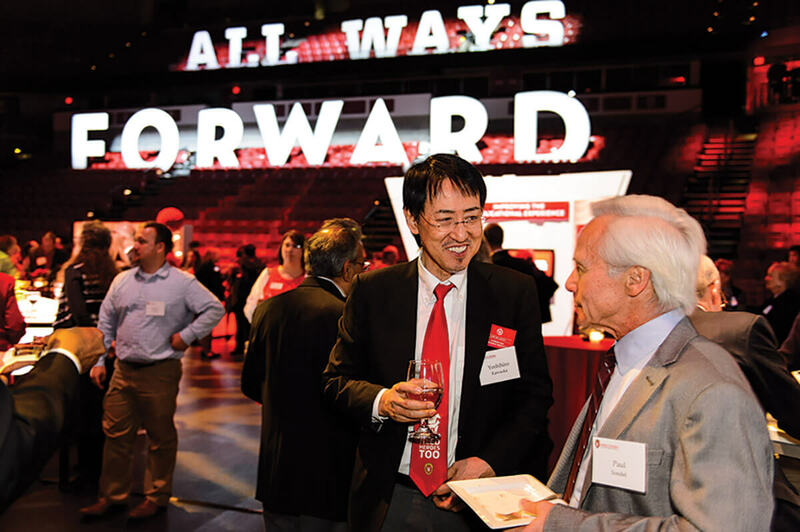 In June 2015, the Nicholases offered a $50 million matching gift to inspire UW alumni and friends to donate in support of undergraduate and athletic scholarships and graduate fellowships at UW–Madison. 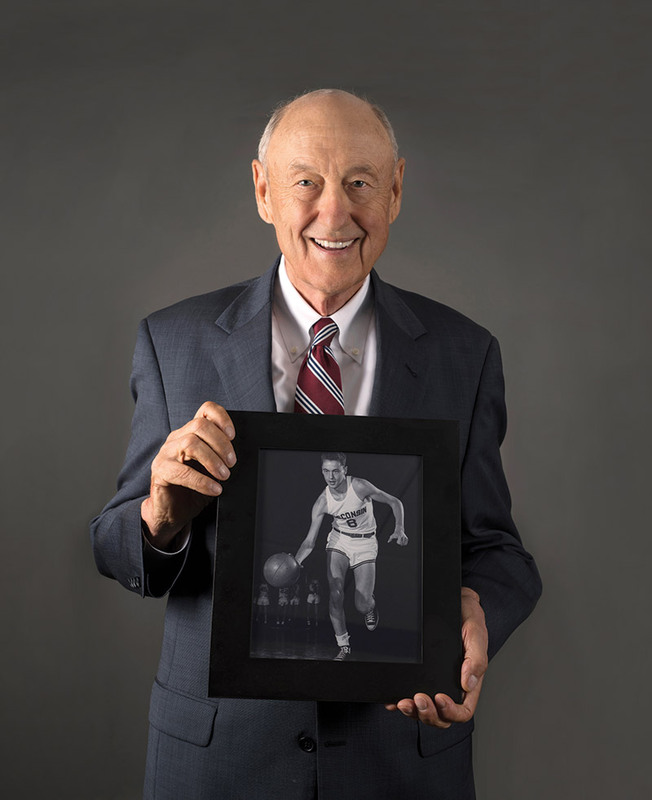 Nicholas served as president of the UW’s National W Club, which supports intercollegiate athletics, and he was inducted into the UW Athletics Hall of Fame in 2009. He was named a Wisconsin Distinguished Business Alumnus in 1985 and earned the Wisconsin Alumni Association’s Distinguished Alumni Award in 1993. With a chorus of “Varsity,” Chancellor Rebecca Blank sent the new campaign into high gear at a launch party in October. Above (from left, flanked by members of the UW Band) are John Morgridge, Blank, Tashia Morgridge, and Mary Sue '81 and Mike '80 Shannon. 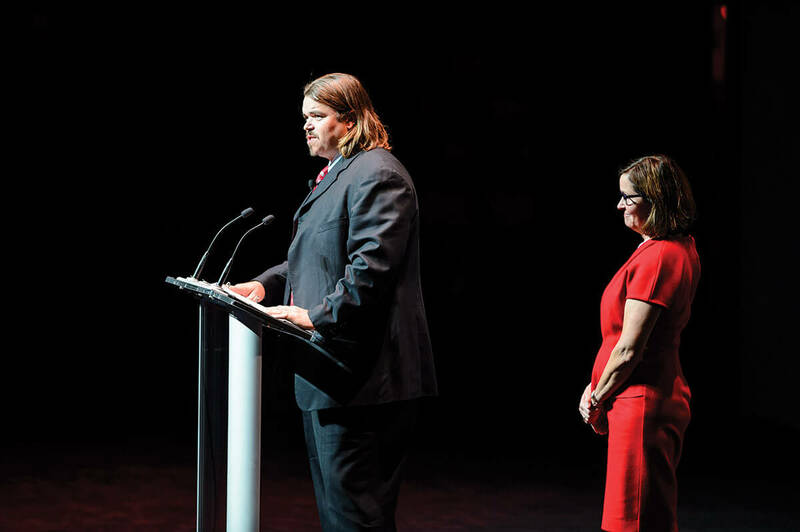 Former Badger football player Mark Tauscher ’99, MS’03 served as one of the event’s emcees. Mary Sue Shannon ’81 looks on. It’s possible you aren’t familiar with All Ways Forward — not yet, anyway. This is the name for the comprehensive campaign for UW-Madison, publicly launched last month at an event in the Kohl Center. But Vilas was much more than the building and zoo that carry his name. He was a lawyer and a Civil War hero and a lumber baron. He served the UW as a professor and as a regent, and he served the nation as secretary of the interior, as postmaster general, and as a U.S. senator. Still, that’s not what makes us think he’d support All Ways Forward. The key piece of his legacy is what he did when he died: in 1908, Vilas left his entire estate, $1.8 million, in trust to the UW for the purpose of funding distinguished research professorships. Vilas was the first alumnus to put serious money behind enhancing UW teaching and research, and his gesture inspired followers (although the trust didn’t begin paying to the UW until after Vilas’s daughter died in 1960, so some of his followers’ gifts actually preceded his). Still, it was a slow-burning trend. Between Vilas’s death and November 2014, the UW built up 142 fully funded, endowed chairs and professorships: an average of 1.3 per year. 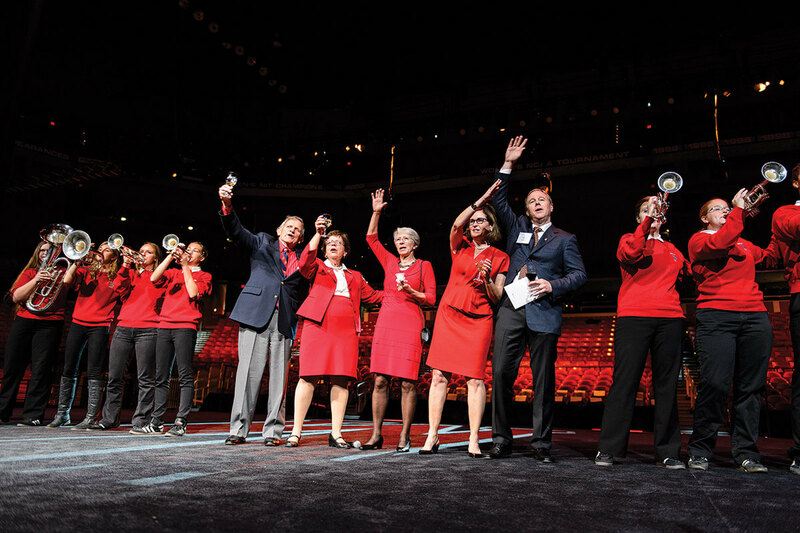 That slow burn sparked to high flame last November, when John ’55 and Tashia ’55 Morgridge offered $100 million in matching funds to support faculty chairs and professorships. Over the next seven months, donors responded, and the Morgridges upped their offer to $125 million, so that the university will receive $250 million. That more than doubled the number of fully funded chairs and professorships, so the total tops 300. Vilas wanted to see the UW become a leading institution in perpetuity, and that’s what the campaign is about: creating large-scale change to ensure the university’s stature. All Ways Forward, notes UW-Madison Chancellor Rebecca Blank, is “only the fourth comprehensive fundraising campaign in our history — and by far the biggest,” with a goal of bringing in $3.2 billion by the end of the decade. Though the university has been through a rough year with Wisconsin’s legislature — swallowing a big budget cut and changes to tenure that made faculty more than a little unhappy — Blank insists that the campaign isn’t about patching holes in state support. It’s about building on UW-Madison’s excellence. But though the launch was last month, the campaign has actually been underway (in a “quiet phase”) for more than two years. 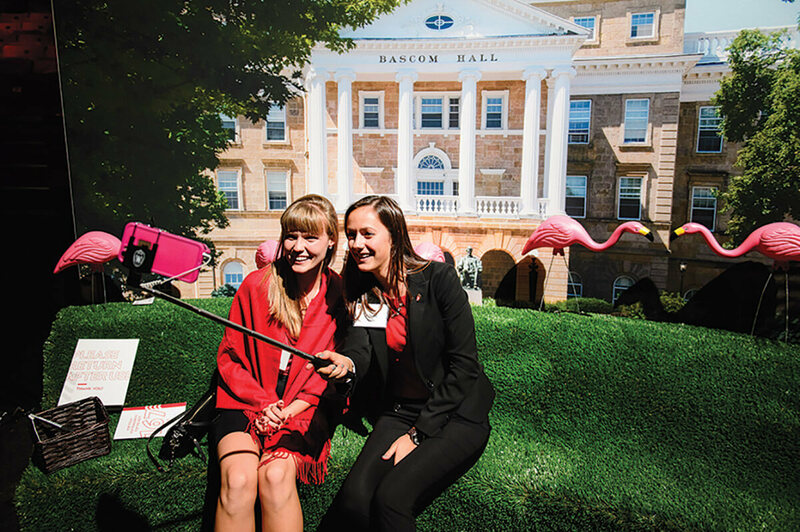 Since July 1, 2013, the UW Foundation (which is UW–Madison’s official fundraising and gift-receiving organization) has received more than $1.2 billion, about 38 percent of the final goal. That includes the Morgridges’ gift, as well as a $50 million matching gift for scholarships from Albert ’52, MBA’55 and Nancy ’55 Nicholas; two gifts from The Grainger Foundation, adding up to $47 million, to support the College of Engineering; and a $28 million gift of art and funds for art education from Jerome ’48 and Simona x’49 Chazen. And they’re the kinds of gifts that Colonel William F. Vilas would understand. John Allen is senior editor of On Wisconsin . For more about the campaign, see allwaysforward.org.